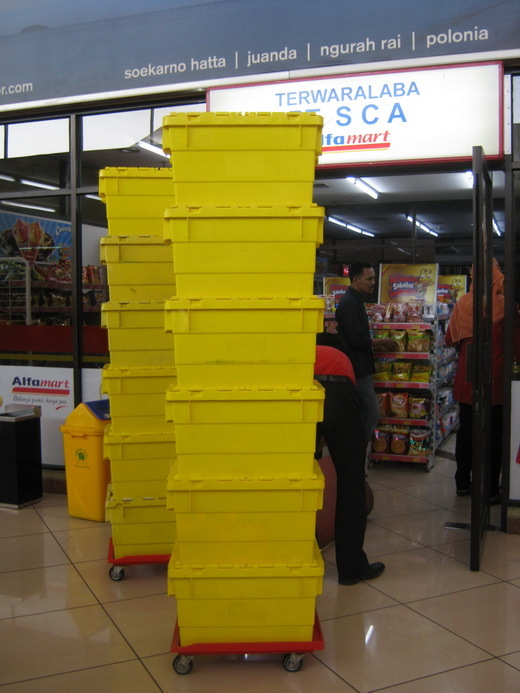 I saw these yellow containers in the front of a small store at Juanda Airport, Surabaya, Indonesia. I didn't know what's inside it. Merchandise, perhaps? Great find for MYM. Have a fabulous week. Hope you can come and see my YELLOW post. Thank you! I have Lite Brite for mellow yellow. Your visit will be so much appreciated! You're very observant Lina! Nice shot. i'm craving for something sweet. They are stake so high, I won't want to stand next to them. Yea so high, it must be shoulder level stock pile it can be dangerous, I like the brightness yellow of container. nice one Lina...I wonder what's inside too...hmmmm! I like the color. This are used to put passengers fragile "stuff" ^_^ Happy Monday! great finds..nice shot..I rarely find something yellow accidentally.. Probably merchandise. I lvoe those yellow containers. Great for storage.